After he watched the anime on TV at the hotel during a trip to Spain, my French boyfriend became fond of “Crayon Shin Chan”. 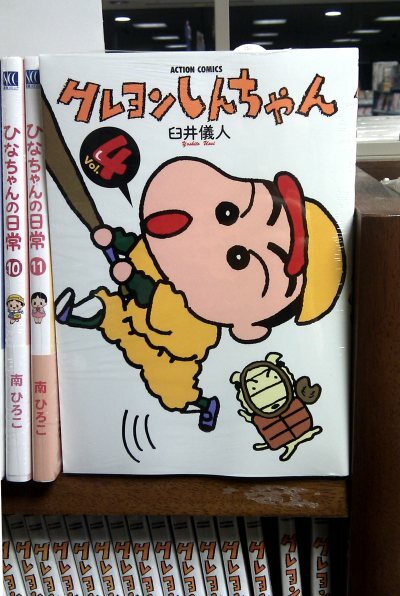 “Crayon Shin Chan” started when I was a primary school student, so it is quite old. 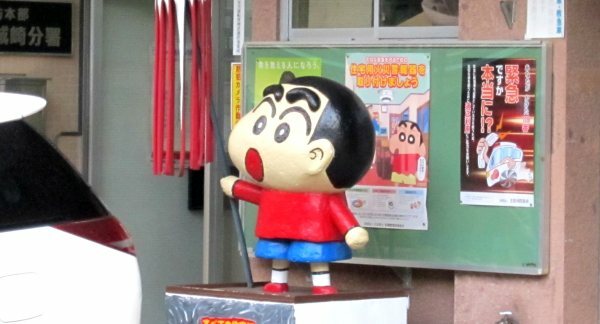 In Spain we found a “Crayon Shin Chan” toy, for the first time I realized it was popular in foreign countries. I also have the comic books, the other day I read them again – something I hadn’t done for a long time. I was then quite surprised by the (strong) level of the content. In the firsts episodes, there were many dirty jokes, it was quite vulgar. Indeed, when the anime was first broadcasted, it was said it was “an anime you don’t want to show to your kids”. However, I don’t know when it happened, but the number of dirty jokes of the old time decreased, and now it turned into an animation for the family. Too bad! Anyway, Shin-chan’s stupid way of speaking didn’t change over the years. Recently I’ve been thinking that if the author Mr Usui were still alive, we could read more interesting books.